We stand at a crossroads. To one side, the path of ‘business-as-usual’ - environmental devastation, social inequality, and a world hurtling towards climate chaos on a scale not seen for tens of thousands of years. To the other side, a glimmer of hope - a vision for a healthy world founded on justice for people and planet. Women around the world are rising up to demand that we take the path less traveled and build a livable future for all. The time has come to listen to their calls and bring women’s innovation, stories, struggles, and solutions to the forefront of the climate change conversation. The bottom line is that women are hit first and worst by the adverse impacts of environmental degradation and climate disruption. They make up an estimated twenty million of the twenty-six million who have been displaced since 2010 as a direct result of climate change — in other words, 80% of global climate refugees are women. Studies have revealed that women are more susceptible than men to the harmful effects of pollution in the air, water, and soil – not to mention the dangerous and deeply personal effect of toxins on pregnant women and their developing babies. Indigenous women who rely on nature and primary resources for their survival, as well as for their spiritual and cultural grounding, find themselves directly threatened by mining projects, industrial agriculture, fossil fuel extraction, and mega-dams. In frontline communities, gendered and sexual violence against Indigenous women is heaped on top of other dire impacts perpetuated by the industries that bear down on their homelands. In so called ‘developing’ countries, drought, flooding, and unpredictable temperatures put pressure on millions of women who, due to gender norms, hold primary responsibility for providing food, water, medicine, and firewood for their families. When we analyze root causes, it is clear that women experience climate change with disproportionate severity precisely because, at a global scale, their basic rights continue to be denied. Enforced gender inequality reduces women’s physical and economic mobility, voice, and opportunity in many places, making them more vulnerable to mounting environmental stresses. Sri Lanka’s 2004 tsunami, for example, killed more than twice as many women as men, for reasons ranging from a lack of economic independence, to never being allowed to learn how to swim. For long-lasting change, it is essential that we recognize, understand, and transform the dominant social constructs that lie at the root of such gender inequality as well as the destruction of the Earth. We need to look at systemic change and challenge old paradigms of patriarchy, colonization, imperialism, and capitalism – which are based in great part on power over women and the planet. Violence against the Earth is directly linked to violence against women. It is long past time to end these old constructs and welcome a new worldview of gender equity and respect and harmony with Nature. However connecting the dots between women and the Earth is vital not only because of the extreme climate impacts felt by women, but also because of the unique insights and immensely powerful solutions that women bring to the table. From the heart of the Amazon Basin to the forests of the Democratic Republic of Congo, from the Gulf Coast of the U.S. to the islands of the Pacific, women stand on the frontlines of global efforts to revision and heal our world. They are rising with fierce resolve, aware that current responses at the national and international level do not suffice given the scale of crisis we face. In most regions, women are already central stakeholders in farming, water and resource management, and household consumption decisions, making them uniquely poised to chart a new social, economic, environmental, and political course. Women provide 60 to 80% of household food production in developing countries. Consequently, when we are talking about food security, food sovereignty, and ecologic agriculture we are talking about women. In a variety of fields, women worldwide are modeling small-scale solutions with potentially large impacts, and this is critical to creating a healthy future. Because climate change and environmental degradation are large-scale problems, solutions are often discussed in terms of sweeping measures and top-down initiatives. However it is precisely these large-scale, top-down, profit-driven processes that have led to this crisis in the first place. As such, fully engaging women’s solutions to reclaim power at the local, community, and household level is of the upmost importance. 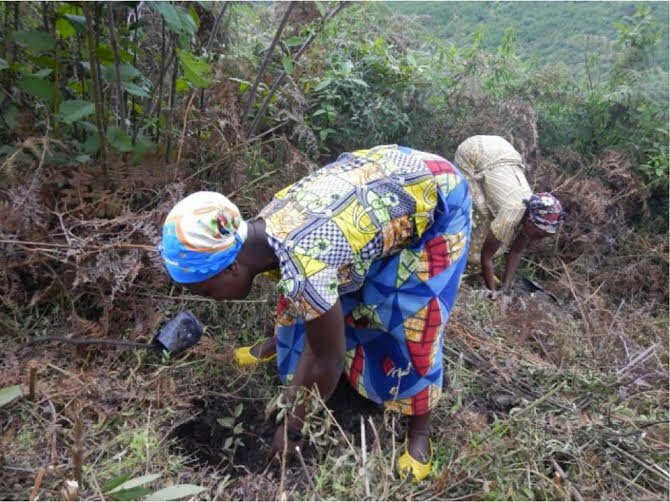 Women re-foresting the Itombwe rainforest in the Democratic Republic of Congo. Photo: Neema Namadamu. Women’s participation in decision-making has direct impact on climate change policy and action. Research involving 130 countries demonstrated that countries with larger numbers of female parliamentary representation are more likely to ratify international environmental treaties. 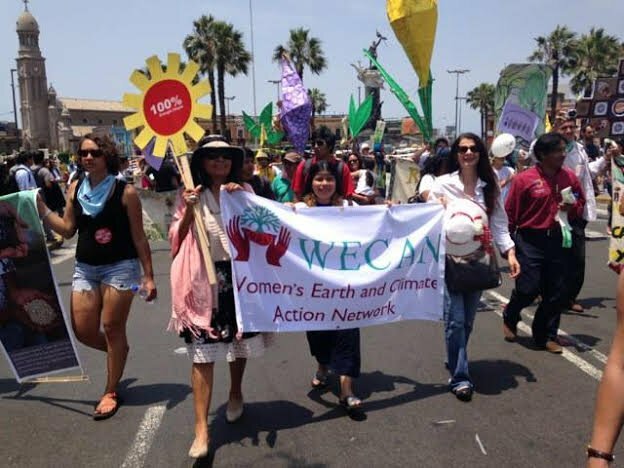 The Women’s Earth and Climate Action Network (WECAN International) was founded in response to the knowledge that climate justice and gender justice are inseparable, and that women’s leadership is critical to climate solutions. Everyday we engage with women who reaffirm these convictions. Women saving seeds, women launching solar power projects, women planting trees to heal destroyed lands, women building resistance movements to keep fossil fuels in the ground and protect their territories. We see women coming together across issues, regions, and cultures. We see gender, women’s rights, and policy groups standing alongside frontline, Indigenous, and grassroots women leaders. We see women making links between gender justice, Indigenous rights, racial justice, worker’s rights, and Rights of Nature. Critically, we see dialogue opening between worldwide women with a variety of experiences, allowing us to address the effects of lifestyle and consumerism of Global North women on women in the Global South. Women coming together to cross pollinate ideas and build understanding about differing burdens, responsibilities, and solutions is an essential part of worldwide efforts to restore the health of the planet. This December 2015, world governments will meet in Paris for the United Nations COP21 climate negotiations, where they will work to finalize an agreement with profound implications for the future of the Earth, future generations, and all life on the planet. Women’s leadership has never been more critical. Aware of the urgent need for women’s voices at the forefront, WECAN International has released a call for a Global Women’s Climate Justice Day of Action later this week, on September 29th, 2015. Throughout the month and on the 29th itself, women around the world are gathering to raise their voices and hold decentralized local actions to highlight the climate impacts their communities face, share their solutions and demands, and demonstrate why women are key to climate justice. Women from thirty countries and counting are taking action, ranging from creating a sign and submitting a picture displaying their climate message, to marches and demonstrations, protests at fossil fuel extraction sites, educational events, art projects, and other actions and statements to highlight local struggles and solutions being offered by women. Worldwide stories, photos, videos, and action re-caps are being shared and amplified via an online action portal, and will additionally be presented and honored as part of a September 29th hub event in New York City. As part of the Global Women’s Climate Justice Day of Action, worldwide allies are also invited to sign and share the Women’s Climate Declaration, a powerful climate justice manifesto available in five languages, and drafted by more than 100 women leaders from around the globe. Collected signatures will be delivered to world government s gathered at COP21 climate negotiations in Paris in December as a diverse, powerful collective voice of women for climate justice. The Global Women’s Climate Justice Day of Action is about demonstrating our resistance to social and ecologic degradation, presenting our visions for the future, and showing the diversity, strength, and passion of global women working for a healthy, just world. It is about bringing our determination to the surface and getting inspired by a visual manifestation of our vulnerabilities and fierce strengths. It is about bringing our voices together in solidarity and issuing a wake-up call to the world that the time has come for bold and immediate action on climate change. We welcome our male allies to join us by supporting women’s leadership. The call for women’s voices is not about putting men down, but rather about lifting women up, and men and women working together equally. You can add your voice to the Global Women’s Climate Justice Day of Action by uploading your photo to the global submission portal on, or before, September 29. For further analysis of why women are key to climate justice, and an action plan for our path forward though COP21 climate negotiations and beyond, see the Women’s Climate Action Agenda.